Imagine what our faith would look like if we upheld and centered the history, the perspectives, the voices, and the leadership of Black Lives of Unitarian Universalists. What would become possible? What new doors would open to us if we became the truly inclusive faith we dream of being? This service will include a special collection for the Black Lives of Unitarian Universalism (BLUU) as part of our commitment to nurture a radically inclusive, justice centered, multiracial and multigenerational religious faith! Silent Night. Join us for carols, stories, and fellowship as we celebrate Christmas Eve! The children will participate in a traditional advent spiral, setting a contemplative mood for the holiday. You are invited to bring cookies or other snacks to enjoy with cider and hot cocoa after the service. Join us on Saturday November 3rd starting at 7pm for a great fundraiser for UUFF. This will be our eighth(!) annual evening of fun to support UUFF. It will be a great evening, and all funds raised go to support our Fellowship. Music in the Woods presents Heart of Alaska Strings. 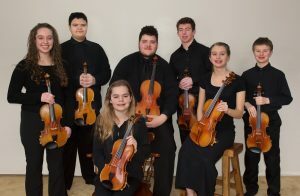 Classical solo and chamber works performed by some of Fairbanks’ finest young string players. In the spirit of Independence Day, join us as we explore our 5th and 6th Unitarian Universalist principles: Our commitment to the democratic process, and our dream of a world community ensuring peace, liberty, and justice for all. 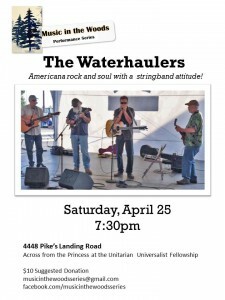 The next MITW concert will take place on Saturday April 25th at 7:30pm in the UUFF Sanctuary. 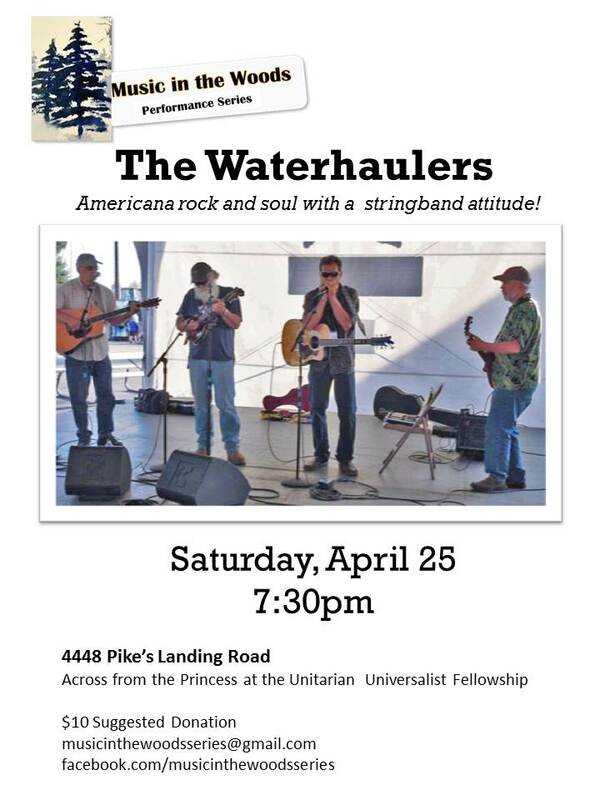 Join us for a rousing good time with The Waterhaulers: folk, Americana, blues and more. $10 suggested donation. We will NOT be allowing parking at the UUFF parking lot during the Iditarod festivities on Monday, March 9th. Our parking lot is private property and we hope that people will respect that. UUs are invited to meet for good food and conversation on the 4th Tuesday of each month at 5:30 pm. The Supper Club will be held every month at the same restaurant, LemonGrass Thai Restaurant, in the Chena Pump Plaza. Come on out and enjoy good company and a beverage or dinner. For more information please call RD Levno at 488-7227.